It has been on my heart to tell the story of my son. And, as I have lain awake throughout the many nights of his newborn life allowing the words I want to express flow freely through my mind, they seem to allude me now. I don’t know where to begin and I’m afraid that once I do begin I won’t be able to end. Maybe that’s the reality of his sweet little life. A bumpy, difficult beginning but a story that is without limit on beauty and possibility. Let me begin by telling you how my little Cash came to be. During the summer of 2014, my husband and I started discussing whether or not we were ready for another little one. We already had our wild little man Parker who was to turn two in August and we had already thought we wanted them to be closer in age. Ultimately, we agreed that in May I would get off my birth control and we’d just ‘let it happen.’ I know we’ve all heard that before from many couples. “We’re not trying. We just aren’t doing anything to prevent it,” they say. My response to them is always “yeah. That’s called trying.” Whatever you call it, in May I got off my birth control. Soon, though, I decided that I wasn’t quite sure if I was ready. I loved my job and absolutely loved our little family. I thought maybe waiting another year might be right for our family so in June I got back on the Nuva ring. I know you’re already exhausted with my indecisiveness. Well, Warren and I talked about it again and decided we would just ‘see what happens’ again and that if I wasn’t pregnant by September (I’m a high school teacher and I wanted to plan it just right with work so that I would be able to take off at the end of the year and not the first), we would try the next year instead. At the beginning of August, I found out I was pregnant only a month after quitting my birth control. Yeah, fertile mertle. We were excited and happy that God saw us fit for another sweet soul and told our families pretty soon after finding out. We decided to keep it on the down low from the general public until I had my first ultrasound. Once I was around 10 weeks, we let the rest of the world know. My morning sickness this time around was horrid which led me to believe even more so that it was a girl. I dreamed of giant bows, poofy hair, and frilly dresses. Just a few of my favorite things. When I was about 14 weeks, I randomly asked my OB at an appointment whether or not she would have been able to see any genetic abnormalities on that first ultrasound. I was just being a paranoid momma wanting to make sure my baby was okay and wasn’t surprised much when she said no, not quite yet. She did say that there was a blood test they could do that could potentially test my risk factors and, sort of ignorant to what the test actually looked for, I said why not. When I went to get my blood drawn, the lady drawing my blood warned me that she hated this screen. She said it had come back as a false positive for Down syndrome for her little boy and it does nothing but freak many mommas out. A few days later, one of the nurses for my OB left a message on my phone saying that the tests had come back and that I did show an increased risk for having a baby with Down syndrome. When I called her back, she said she did not in any way want me to be concerned because they truly did not feel like I had anything to worry about. I was young (26 at the time) and the odds weren’t terrible (1 out of 56) and that later ultrasounds should ultimately show if anything really was wrong which they didn’t think there was. If you know me, you know I’m a natural born worrier. At first, I shook it off and tried not to sweat it. But, then the fear grew within me, and by a couple days later, I was literally in full blown panic mode. I remember putting my toddler in the bath one night, my husband at work, and absolutely falling to the floor weeping. How could we handle a child with Down syndrome? How much would our lives change? Would we be taking care of someone for the rest of our lives? After a frantic phone call, my policeman husband sped home to comfort me. Thankfully, he’s the rational one out of the two of us and reminded me of our odds. 1 out of 56. I teach math and those numbers tell me that there is a less than 2% my child would have down syndrome. Those are pretty good odds and he reminded me of that. He said that even if we did have a child with Down syndrome, it would be hard but, we would make it. As the days went on, I let the worry consume me less. Although it was often in the back of my heart, I knew that I was probably just being my dramatic self and when I did worry, I didn’t let my family know because I didn’t want them to think I was being a freak again. My mom helped to comfort me too. She had such a peace about it and, since I pretty much know she has a direct line to Jesus, if she felt a peace about it, it had to be fine. After all, she is approaching sainthood. So, we moved on and as the ultrasounds came and went the tech continued to calm our fears. I remember one particular ultrasound she even said that, out of her 18 years of experience, there has only been one baby that had downs that she didn’t see beforehand. Again, those are GREAT odds. I’ll take them. The morning sickness eventually subsided but the pregnancy still carried some setbacks. My blood pressure became high as early as 16 weeks this time (partly due to my crazy anxiety after those test results) and I had to take regular medication to ensure that it stayed regulated. Life went on and baby stayed healthy. At 17 weeks, we did a private ultrasound to determine the gender. Many family members gathered together to see the gender of our sweet one. Right when the tech put the probe on belly, I saw it and knew. It was another sweet boy. Surprisingly, I wasn’t disappointed. I was happy that our Parky was going to get a brother and of course Warren loved the thought of more Batman and Power Ranger fights. It took us longer this time around to decide on a name. After going through name after name, we decided on Carsen Asher Seals. Asher means ‘blessed one’ in Hebrew and he was one of Jacob’s sons to lead the twelve tribes of Israel. When we chose Asher, I remember thinking of the small possibility that he could have Down Syndrome and thought that was so fitting. "Happy One." The irony is incredible to think about now. We couldn’t decide which name we wanted to call him so jokingly, Warren mentioned one day that we should call him Cash and it stuck. Time moved and so did our lives. We prepared, enjoyed our toddler, went about our jobs, and decorated his room. Two boys. I knew being a boy mom would be fun and loved the thought of how close our boys would be. Each ultrasound confirmed that he looked and measured perfectly so my fears continued to be relieved. As my pregnancy progressed, my blood pressure started to act up again despite the medication and my OB decided to do an extra ultrasound at about 35 weeks to check and make sure that my blood pressure wasn’t affecting his growth. The ultrasound showed that, overall, he was measuring a couple weeks behind so with that came more monitoring and a short hospital stay to stabilize my blood pressure. After a week and a half of bedrest, we finally decided to go ahead and do a scheduled C-section at 38 weeks. April 1, 2015. An April Fools baby. I was afraid no one would believe me when I told them that he was coming on April Fools. Parker stayed with my mom the night before so we could be at the hospital at 5:30 am. Warren and I were a nervous wreck but so excited and ready to get this thing done. We were the first C-section at 7:15 am. As they wheeled me back, Warren by my side, I was so anxious. Would he be okay? Was he too small? Were his lungs okay? As they got everything set up and began the procedure, I had Warren give me a play by play as he peered over the sheet. Was he out yet? Finally, I knew that they were getting ready to pull him out and I prepared my heart. I heard his sweet cry and the tears started flowing. That sweet cry meant so many things to me. It meant he was breathing, he was healthy, and he was ours. Warren said he looked like Parker and I watched him as he stared off at the other side of the room towards the cry. I waited and it seemed to take forever. Warren was seemingly quieter this time around as he watched the nurses do their thing before I could see him. I know now that he was quiet because he noticed that Cash looked bluer than he thought he should. He watched as the nurses put a small little mask on our baby to give him a little oxygen. They hadn’t done this with Parker. Finally, after what seemed like forever, they wrapped that little ball of love up in a blanket and brought him around the sheet so that I could see his face. Subconsciously, I assessed him and I noticed something strange. One of his little hands was sticking out by his face and I noticed it seemed smaller than it should. I kept asking Warren why his hand seemed small and he just said that he had smaller hands. There I was again. Overanalyzing and worrying for no reason at all. On our way to the hospital the morning of--nerves! Moments later, they whisked Warren and the baby out of the room to get him weighed, etc. as they stitched me up and returned my organs to their proper location. As I lay there alone, I think my heart knew. Something was different about that little hand. Something. Once they were finished with me, they wheeled me around to an observation area where the nurse was to monitor for about 45 minutes. Eventually, my mom came back to check on me for a minute. I wanted to ask her what I was thinking. I wanted to ask her if it seemed like anything was wrong with him and if he showed any signs of…I almost felt like if I said those two words it would make it real. It would seal the deal and again I didn’t want them to think I was still worrying over something from months ago. Finally, I just asked my mom if he showed any signs and I knew that she knew what I was talking about without have to say those two words. “No, he is perfect.” Those words brought me some level of comfort, but my heart still felt unsteady. I just needed to be with him. Not long after, they wheeled me back to my room and all million of my family members followed closely behind. Except for my husband. He was still with Cash and I longed for him to be with me, to calm the fears that I wanted so desperately to hide. Finally, he came but he was alone. He said that when Cash was born, he was breeched and inhaled some fluid in his lungs so they were going to have to give him some oxygen. He was going to go back to see him but I wanted to ask him before he went but those two words choked me again. I knew that I had to ask so finally I said it. “Does he show any signs of down syndrome?” Calmly and surely he said no, hugged me, and went back to check on our son. Our pediatrician came by to explain that he was turning over our baby to the head neonatologist to handle his needs with his breathing. Again, I asked him the question that kept tugging at my heart. Once again, he said no and slowly, I felt more peace. My families first time seeing little man. At this point, no one knew of his diagnosis. My husband. That sweet, humble rock of mine knelt beside my bed. I’ll never forget those words that followed. “The NICU doctor thinks he shows signs of Down syndrome.” I remember his tears as he whispered those dreaded words as I began to cry myself. And all I could whisper through the tears was, “I think I knew.” And we wept. All of us in that room. Grieving the life for my child that I had dreamed of and prayed for in my womb. The little boy that I had only spent moments with in this world but had felt nudge and hiccup all those months. Grieving the dreams I had dreamed for him, the marriage, the children. All the things that felt destroyed with this discovery. I don’t remember much of what else happened that morning. I remember just wanting to see my son. Wanting to feel that bond with him. Desiring to at least allow the comfort and love I would feel from knowing that he was ours outweigh the despair I was feeling. Finally, they came and told Warren and I that we could go back into the NICU to see him. Warren had been with him for a little while up until this point but they hadn’t let me yet because of the surgery. As they wheeled me through that hallway, I felt like everyone was watching me. In reality, I know that the nurses and people likely didn’t even know who my son was, but I felt self-conscious. Like they were looking at me with pity. I hate feeling pitied. To get to the NICU, we had to go through the main waiting room for the Labor and Delivery floor. From a distance, I could see my older brother standing not far from where the doors to the NICU opened. If you know me and my brother at all, you know that we are very different. We love each other deeply but we communicate our emotions in very different ways which often makes our expressions of endearment towards one another less frequent. As I saw him there, waiting, I suddenly craved his comfort. Would he still love him? As my wheel chair neared him, he leaned and hugged me and I began to weep. I will never forget this moment with my brother as long as I live. In those few seconds, I felt so comforted by his tenderness in a way he’s never shown before. I felt his sorrow for me, the fact that he couldn’t change or help what was, and his love. Few words were spoken but his actions eased my hurt in small ways. I knew he would love him. Finally, Warren wheeled me towards the NICU and in we went. He turned me around a corner and, out of all the babies huddled in that winding room, I knew which little one was mine without even truly seeing his face. As I studied him, I looked at my husband, tears shadowing my face, and said “He’s ours.” I loved him so deeply yet my heart still ached. I ached for his pain and his future. I ached for my husband and my other son. I ached for what our life would be. The rest of that day was a blur. I remember floods of people coming and going to show their love and support. I remember my family and I remember feeling moments of hope that everything would be okay that day. By the end of the afternoon, I actually remember laughing at times at different things. But then night came and with it the deepest darkness my soul has ever felt. My mom took Parker home that night and Warren was ready for his night posted on the couch. I had yet to know the intimate way my soul would be revealed to my husband that night. Many of my thoughts and feelings of this night bring so much shame on the selfishness of my humanity. However, I want you to know the ugliest part of me because it truly is a valuable part of my journey. Ultimately, I know that this journey will lead me to Jesus’ feet, regardless of whether I feel it at a given moment or not. I can see now that sometimes getting to His feet is a sinful mess full of questions, despair, and faithlessness and I felt all those things. So, I share how I felt that night with candidness so that you can see the depth of my frailty and know that, despite the filth in our hearts at times, Jesus still chooses us. Every day. Morning did come, and with it, some relief. The pain was still real but the light and business of the day brought more hope. 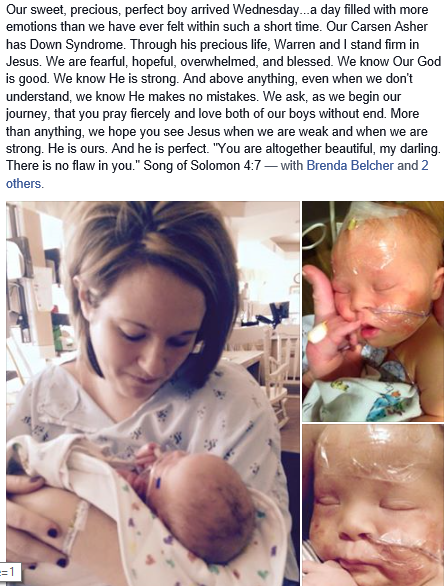 The NICU doctor told us what his concerns and cautions were for Cash’s health. He would need a heart ultrasound to check whether or not he had any heart defects. He was concerned about a certain type of immature white blood cell that was showing up in Cash’s blood called blast. Typically, when the blast cell is found in our system it causes doctors to check for leukemia. Cash’s levels of blast cells were at 54% and he explained that babies with Trisomy 21 are at more risk for leukemia. Many times, babies like Cash exhibit signs of leukemia at the beginning of life but it ultimately resolves itself within the first few months of life. When this occurs, it is called transient leukemia and treatment is not needed. After speaking with hematologists at Arkansas Children’s Hospital, they felt that Cash would be best served at the hospital in Little Rock. Since it wasn’t life-threatening, both hospitals arranged to fly our sweet boy to Little Rock the next morning when I could be released, as well. Cash would fly by helicopter and Warren and I would drive by car to Little Rock. Right before he got on the helicopter. He had to wear little ear muffs to block the sound. Arkansas Children’s Hospital is an incredible facility where we received the most amazing care. We were able to room in with our son, helping to forge a bond between him, Warren, and I. Even more encouraging was that Parker was finally able to meet his baby brother. The first several days at Children’s was incredibly busy with countless family and doctors. I will say that my heart cannot express the love and appreciation we have for the family and friends that have carried us through this time in our lives. You are all God’s breath in my life, especially during a time when I questioned His love for me. I could still feel it through you all. We stayed at Children’s for two weeks. These two weeks were the longest, most emotional of my life. There were times of extreme hope where I praised God for our progress and times where I truly wondered if the God who I had served my entire life was laughing at my pain. In my heart, I knew that the God I love and serve was there and listening but, again, I want you to know and see the darkness, as well. Through this time, I am beginning to understand how much God values our honesty with Him. Even when that honesty is a broken mess of emotion that contradicts all that we know He is. This period in my life has been the first time that I truly understand what is meant in the Bible when it talks about Jacob wrestling with God. I truly felt that I have had to wrestle with who I think He is, who I know Him to be, and the reality of my lack of faith many times. Warren and I have each journey through this process in our own ways but still together. I can say that I cannot imagine this journey without every piece of Warren’s character. I love him with every fiber of who I am and appreciate and respect the man he is more than ever. Oh. My heart. I hear angel's singing in unison when I see this picture. We love that Daddy boy. This was when we first arrived at Children's. He was so swollen from all of the fluids and we had had little to no sleep. As for Cash’s health, the blast cells in his blood are currently down from around 54% at birth to 2% as of Monday. We have to get his blood drawn weekly for a little while until it disappears completely but they are very confident that Cash has transient leukemia which we are so thankful for. It is something that we will always keep an eye one, especially the first couple years of life but the doctors are very confident in this area. His heart does have a very small hole which they believe will clear up on its own and cause no issues. He will also have his heart monitored every handful of months just to check his progress in this area. As for the Down syndrome, blood tests sent to the Mayo Clinic in Minnesota have confirmed he does have Trisomy 21. His type of Down syndrome is what the vast majority of individuals with Down syndrome have called full Trisomy 21. This means that each of his DNA strands has a full third copy of chromosome 21. It was not inherited and occurred completely spontaneously at conception. As for severity, we will not know the true severity of his trisomy until he begins to reach different developmental milestones. For now, we are incredibly hopeful. His muscle tone is very good and he learned how to eat rather easily, which many children in his situation have trouble with. I will say that this child is incredibly strong and active. He pulls that sweet head around far more than I remember Parker doing this soon. I feel at peace for his future. I know it will be hard and our journey will never truly end but I am hopeful that he will be able to do many of the things that I once doubted he would be able to do. I know he will be loved without end and that this child will change the lives of so many in mighty ways. The reality that he will be able to have a very full and successful life is far more real than I initially understood. We love this child so deeply and his big brother is quite smitten with this little soul. I hope to continue to share our journey, even the ugly parts, in hopes of restoring faith through hopelessness and the opportunity to see the beauty of the life and family we have been given. I’ll end with what I shared on Facebook when I first publically told the world about Cash. We still feel all of these things and I truly believe that this status best exemplifies our hopes and beliefs for our son. I love all four of you more than you could ever know! A beautiful read, Brooke. I so admire you and Warren. Your level of faith, honesty, wisdom, maturity and commitment are not often seen in couples of your age; It is a blessing to behold. Love you 4 and keeping you always in prayer. I just found your post via a friend on Facebook. I have another friend who's little boy was born with an extra chromosome. Her name is Amber and she has a blog too (http://amber-webb.blogspot.com/) - she is a passionate Jesus lover and seeks to be a resource and a friend to momma's and daddy's in similar shoes. Your son is beautiful. Grace and peace.